Don’t be afraid to give up the good to for the great. There is this untold race that you are having with other businesses like yours, and there are many of them, across India and around the globe. A restaurant, a supermarket, a cosmetic shop, a retail shop or any other small business, in 2019, it is definite to say that you won’t survive if you keep up with the technology. PAIT BIZ Pvt Ltd, a Retail Software company in Pune and Hardware AMC Provider, is on a spree to help and take the retailers and businesses across India to surpass the potential they have. PAIT systems are the house of solutions with high operational efficiency, better accounting, and financial reporting, faster response time, increased productivity along with cost-effective features all integrated into a single platform, making it highly integrable. I guess the true software solution company is the one which provides the software you want and not the one they have. PAIT systems are known for customization of software according to your needs and with features, only your business requires and are flexible. ‘No one knows your business better than yourself’, but when it comes to technology, we are your partners, is the motto of our relationship with retailers. Technology may seem to be a bit complex for your employees when they start learning it. We provide you 24x7 customer care services and fast actions in case of any failure. Apart from being available, we take care that the retailers we have partnered with are growing at the pace they need and we grow together. Growing means a bit of instability and taking risks. This brings an endless set of efforts to become organized even when the system is not in equilibrium. Retail software solutions provided by PAIT BIZ are programmed so well that you don’t have to worry about your inventory, employee status, and reports, because our retail and POS software can take care of everything. Apart from the best quality services in POS and retail management software, staying updated with the newest technology is just because the change is rapid. Every day the technology is changing, improving and taking a different road and you have got to keep up with that, in order to stay ahead of your contemporaries. We are ERP partners of many small and large businesses in Pune and in India and our expertise in retailing and POS solutions makes us one of the best. We aim to become best for our partners, and we thrive to make your challenges into our fuel to drive ourselves. 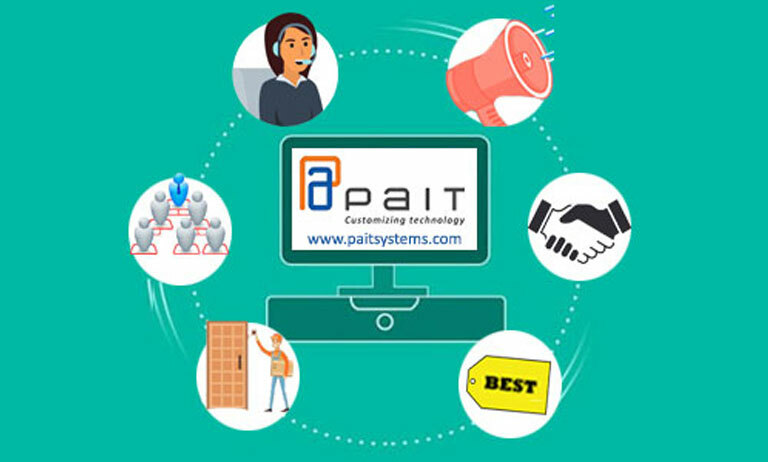 You can check our products and services at www.paitsystems.com Can’t find what to do with your business or don’t know why you aren’t satisfied with the growth of your business? Take a bold step and press the gear to drive into the future with us.